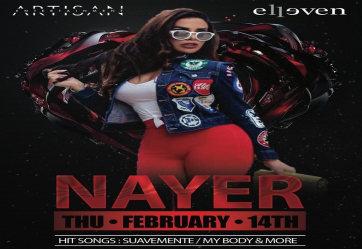 Nayer Regalado, known as Nayer, is an American singer. She gained recognition in 2011 after being featured on Pitbull's hit single "Give Me Everything", produced by Afrojack, and releasing her single "Suave (Kiss Me)" featuring Pitbull and Swedish-Congolese singer-songwriter Mohombi which was a success in Europe and the Middle East. Her other known collaborations include songs with Enrique Iglesias, Fonseca, Yomil (of the Cuban duo Yomil y el Dany), Jean-Roch and Melissa.